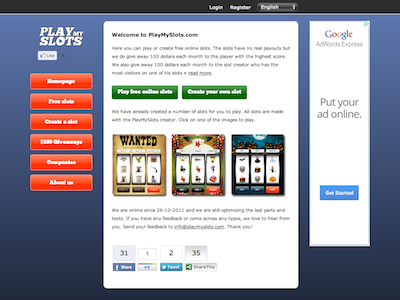 On PlayMySlots.com you can create your own free online slot. You can use your own photos, sounds etc. to show off your creativity. We give away 100 dollar each month to the slot with the most visitors. We also give away 100 dollar each month to the player with the highest score. Playing all the slotmachines is of course also free. Enjoy! It is free and fun. You can adjust almost everything about your slotmachine.